Our 2003 Girls have team training every Sunday. Team training is 2 1/4 hours long, with 3x 45 minute blocks targeting different physical/technical/tactical aspects of the game. In addition, they have Strength & Conditioning on Tuesday nights and Futsal on Thursday nights. In order to give your bodies a break from a long and tiring high school season, the team will only have 1 session per week on Sundays, which will be used simply to warm up then play. Tuesday: Field 4 (Warm-up Space) will be reserved from 6:30-7:45 each week for the players to come and use for technical work & strength/conditioning. This session will be led by players. Thursday: The team will not play Futsal Session 1. We will start to ramp things back up in January. 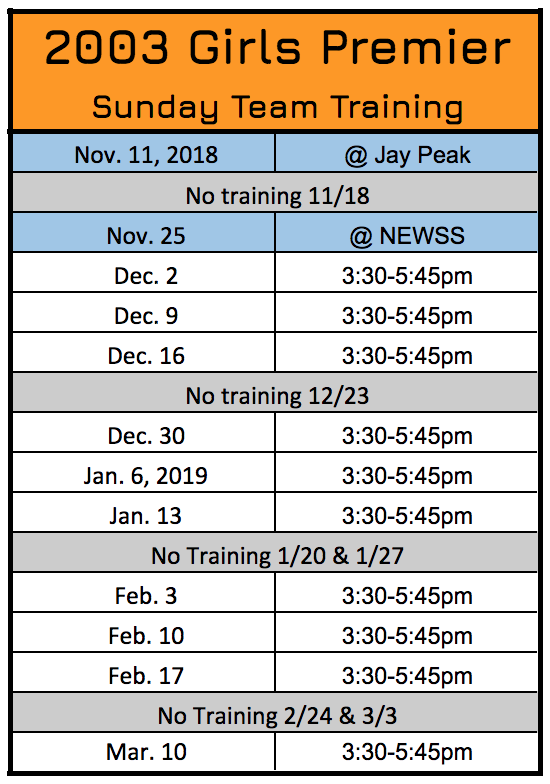 The Tuesday night Strength/Conditioning Session and Thursday Futsal will be added and Sundays will be more of a training environement. Sunday: Normal team training resumes. Tuesday: S&C led by coaches 6:30-7:45pm. We will continue the same schedule from S2, but add in outdoor trainings whenever possible.